Petrol chainsaw will effortlessly power through wood and other materials easily making them a perfect choice for all types of jobs. Tanaka chainsaws in particular are lightweight, and responsive, and come with a range of cc engine sizes to meet the challenge of any job. 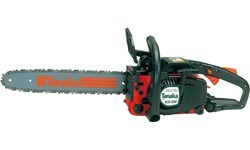 Petrol chainsaws have many other advantages which mean that you can complete your job with ease. As these types of chainsaw use fuel instead of electricity, this removes the likely danger of cutting through a cord during its use. Difficult spaces needing a chainsaw can be easily controlled with these tools. If you need to make precise cuts, when for instance you are trimming shrubs and trees, then these chainsaws give anyone the freedom to move swiftly. Tanaka have different collections of petrol chainsaw comprising a range of domestic chainsaws, semi-professional and professional chainsaws. Many people are looking for a high performance tool that they can use at home. However it is important not to sacrifice on power for domestic use. The Tanaka ECS 3351 Petrol Chainsaw derives plenty of power from its 33cc engine, more than many other home saws, and so is the textbook tool for general use. Many petrol chainsaws feature a two-cycle engine, meaning that they can cut through heavier objects, and the high performance two stroke engine on the Tanaka ECS 3351 will not be caught out. This petrol chainsaw is designed perfectly for the challenge of any D.I.Y job. If you intend using your chainsaw for average to medium use, then contemplate using a more influential engine with a rear handle. The Tanaka TCS 33EDP Petrol Chainsaw with 15" Cutter Bar will make working the chainsaw not only stress-free, but also safer. It is extremely light weight, at just 3.7kg it means that this chainsaw is great for finer cutting. It also comes with the new S-Start, with an easier to pull recoil, so it really is a tool that you can use on the move. As they have a more powerful motor and a longer blade, a petrol chainsaw can cut through wood and similar materials at a specialised level. 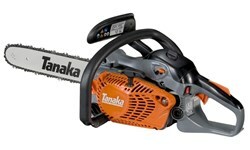 Experts all know that the faster you can complete a task, the sooner you can move on to the next part of the project, making Tanaka professional petrol chainsaws a wise investment. From tree-felling, forestry landscaping to doing heavier ground-work, then a professional chainsaw with a long chain bar and chain, a high capacity cc engine and an accessible rear handle cannot be beaten. 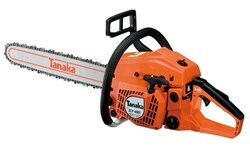 Tanaka chain saws from tanakaspares.co.uk are designed and built to industry standards, and this means larger trees can be capably and carefully dealt with. The engine cylinder positioning of the Tanaka ECV 4501-18 helps to reduce noise, and vibration so it is handier to work with. It also comes with Turbo Force air pre-cleaning which helps to take away the bulk of dirt and dust from the air.